New and improved, the Blood Pressure Tracker is your ticket to a healthier lifestyle. If you’re someone that struggles with the rigors and pitfalls of having high blood pressure or even a family history of having a high blood pressure, try this free template to monitor your blood pressure and see if something you’re doing or eating might be contributing to the problem. People have different reactions to eating certain foods or exercising a certain way. By downloading this Blood Pressure Tracker, you can narrow down the list of causes and provide your doctor with valuable information. To get started today, just follow the link below. Start at the top of the page after downloading the template and read the red box given for more instructions. To the right, you’ll see your ideal blood pressure levels. These are the target goal for you to hit each and every day. You can also list your doctor’s number in this section as well. Scroll past the graph and to the main table of the template. When you enter your blood pressure information into the table each day that data will be transferred to the graph you skipped earlier. You will enter the time, date, AM or PM, systolic, diastolic, heart rate, and any notes that you want to leave for yourself as well. When you finish entering that data into the template, you will notice your graph above automatically update. The example shows many ups and downs. You can then use that information to see why you had drastic changes to your blood pressure. For example, if you notice one day your blood pressure was abnormally high, you can check the day and maybe you simply had too much coffee. 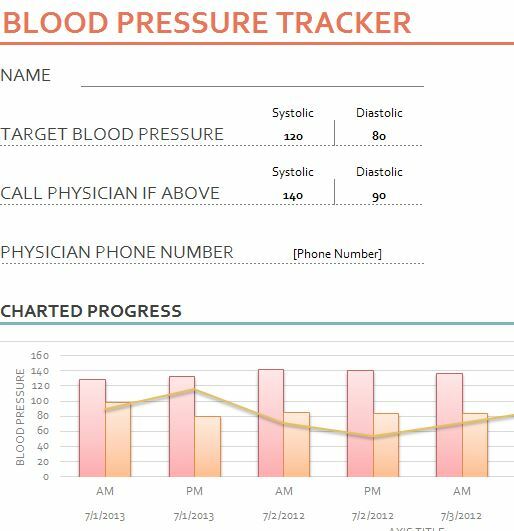 Try this free Blood Pressure Tracker template today.